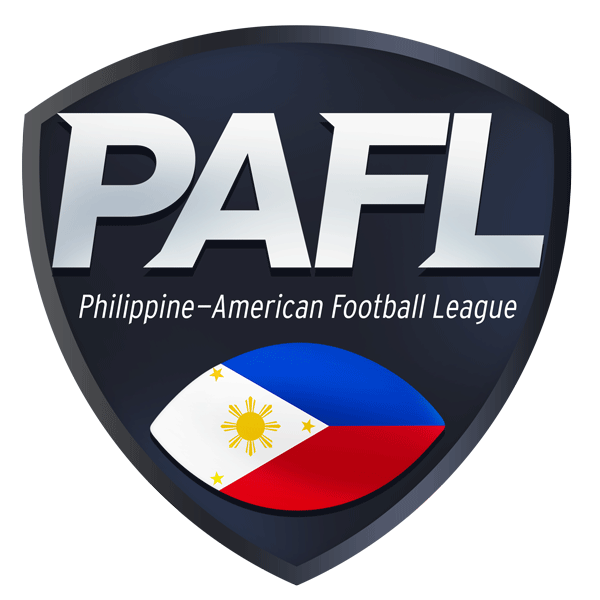 Makati City – The regular games of the 3rd season of the PAFL continues. 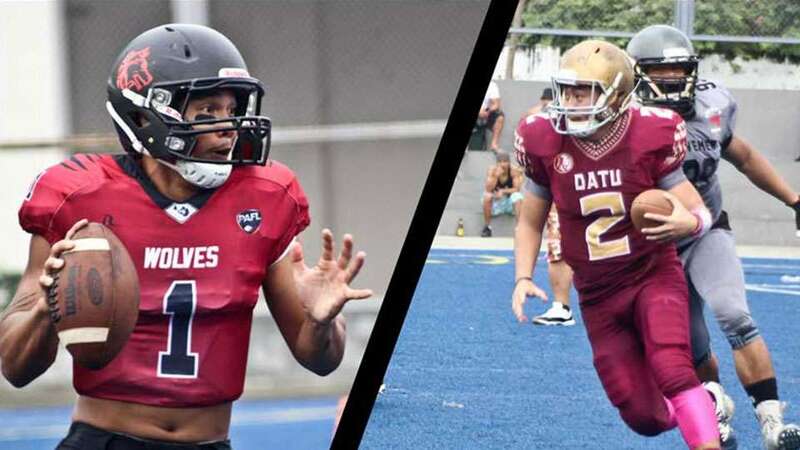 Both the Datu and the Wolves won their first games during the season opener and fans are eager to know who will get the win. The game kicked off with the Wolves kicking team. Kicker Mark Hill did an on-side kick which was recovered by the Wolves. However, referees called the kick short – Datu started off with their offense. 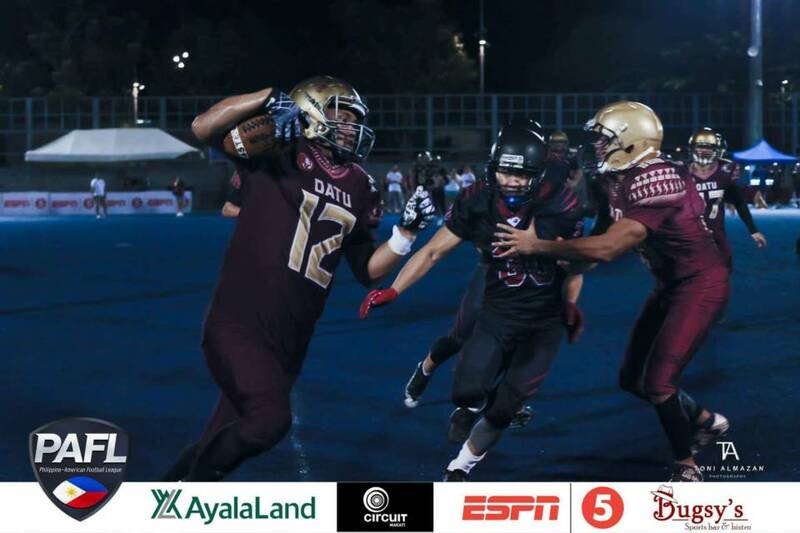 Running back JM Camay got a 5-yard gain when the ball was fumbled but was still recovered by Datu. In another attempt from Camay, the tribe lost yards as Marco Cordova, defensive line, tackled him before the line of scrimmage. After an incomplete pass, the offense lost another 5-yards due to a false start penalty. They decided to trick the defense with a fake punt but was stopped by a tackle from Darwin Gonzales [Linebacker]. The Wolves started with an outside run by running back Joshua Gayta but was stopped 1-yard from the line of scrimmage. 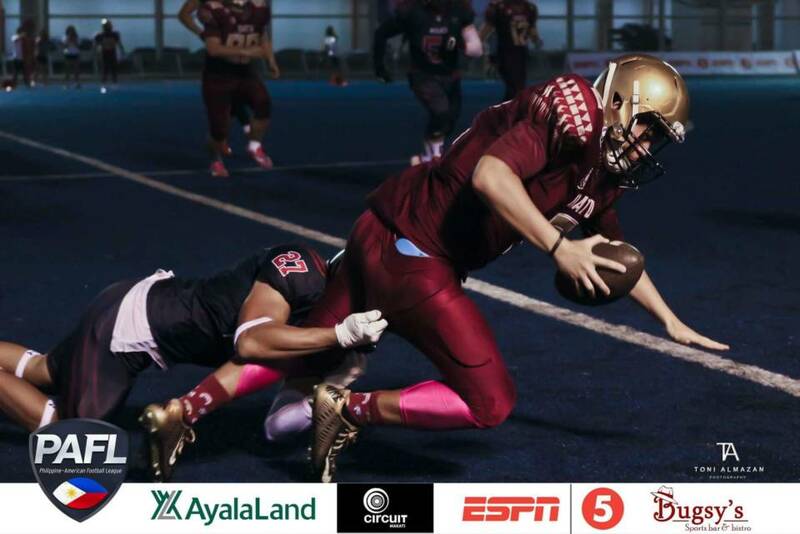 Quarterback Luke “Zman” Zetazate passed the ball to David Paul Jumola [running back/receiver] who almost made it to the 1st down before he was tackled by Jade Waje [Datu]. A quick pitch to Dennis Graves [running back] resulted to a loss of yards but was immediately redeemed with a first down on their next play. After an incomplete pass, Zetazate passed the ball to wide receiver Ivan Klaric who got the first down. Another pass to Klaric gave the pack another first down at the red zone. The Wolves scored their first touchdown of the night with a reception by tight end Martin Antonio. They were able to get the extra point giving them a 7-point lead. 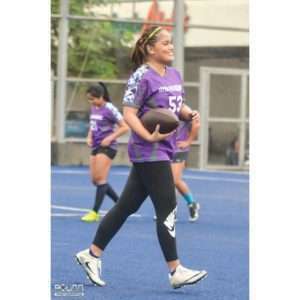 The Datu started at their 25-yard line. A run by Camay quickly became a turnover as the fumble was recovered by linebacker Justin Gunnacao. The pack scored their second touchdown after the ball was pitched to Jumoa who ran it to the end zone. With another extra point, the Wolves were now up by 14 points. The Datu started on their own 30-yard line. 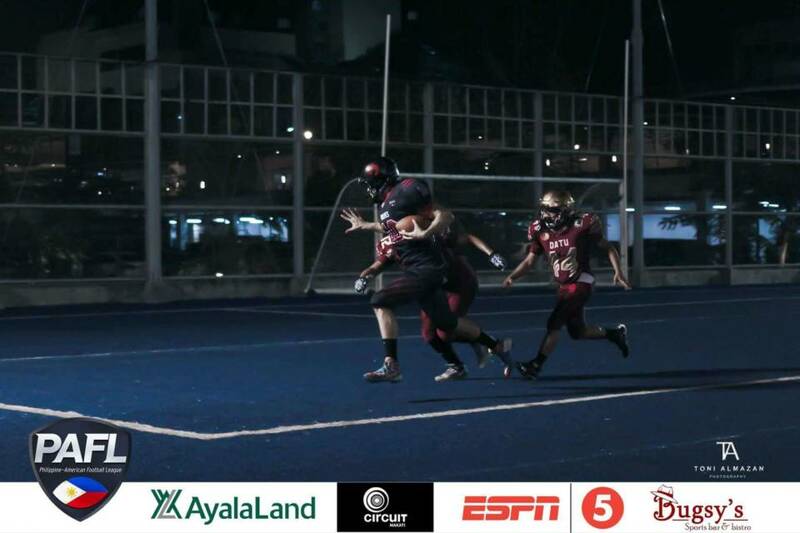 Roel “Wewe” Alvero [quarterback] passed the ball to wide receiver Ian Lim who was able to gain 30-yards before he was tackled. Another pass to wide receiver Giuseppe Vergara gave the tribe their first touchdown of the night. However, they weren’t able to convert as the extra point was blocked and the ball was recovered by Mambuay. 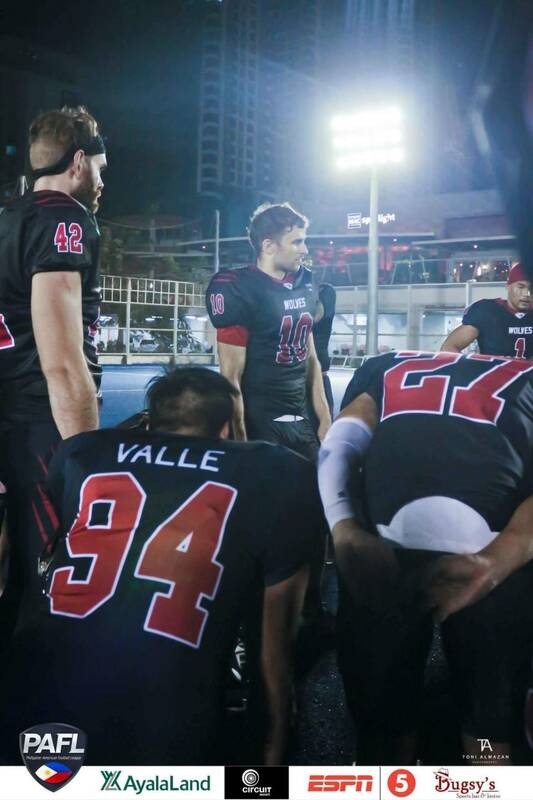 The Wolves started on the Datu’s 42-yard line. The ball was quickly passed to Graves who gained 22-yards and got a 1st & goal. Another pass to Klaric at the end zone and the pack scored another touchdown. Locking-in another extra point, the score was at 21-6. Datu offense started on their 28-yard line. The tribe struggled to gain more yards as they weren’t able to complete any passes. Defensive back Dave Hilao denied the Datu receivers a chance to catch the ball. On their 3rd attempt, Alvero decided to run the ball but gained only 5-yards. With 5-yards short on the 1st down, the tribe decided to punt. The Wolves offense gained another 6-yards with Jumola as running back. With only 40-seconds left in the 1st quarter, the offense went for another go with a quick pass to Gayta who was able to make a 45-yard run and another touchdown. This time, the extra point was not converted which leaves the score to 27-6. The tribe started on their own 28-yard line. 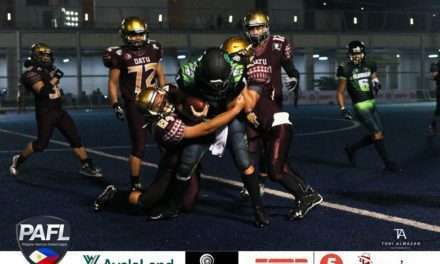 They used a trick play with Aaron Velasquez [running back] getting the ball from the snap but was immediately tackled by linebacker Larry Favorito which resulted to a loss of 5-yards. 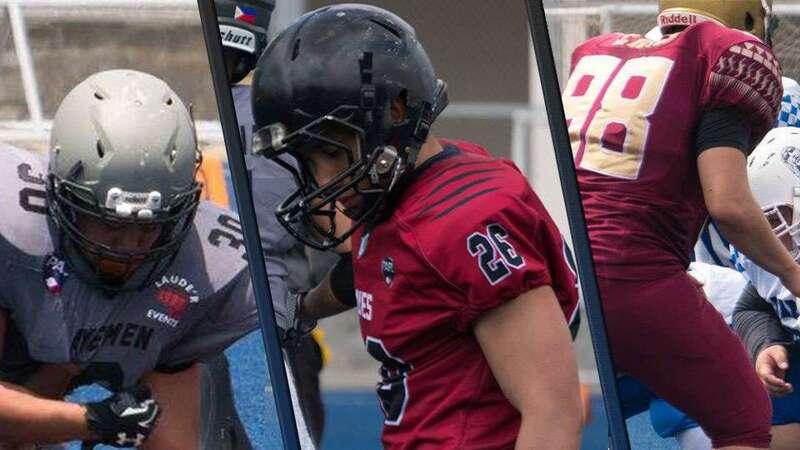 The Wolves defense became more aggressive as defensive back Alden Garcia went for an interception but was tackled by Velasquez at the 40-yard line. The pack gained another 16-yards with a pitch to Graves and another touchdown with a pass to Klaric. Another extra point was not converted. The score was at 33-6. There was still 9:11 left in the first half and the tribe’s offense will start on their 30. After an incomplete pass, Cordova [defensive line] sacked Alvero 10-yards away from the line of scrimmage. The offense wasn’t able to gain more yards – they decided to punt on their last down. The Wolves also seemed to be out of their rhythm as they weren’t able to make the catches and lost some yards because of tackles before the line of scrimmage. Gayta gained some yards with an outside run but was short on the 1st down. They decided to go for their 4th down and immediately got a first because of a holding call on the defense. The pack used Jumola as running back then went for a pass but was incomplete. Gayta was able to make it to the end zone after a short gain on their 3rd play. However, after 2 incomplete passes, Antonio caught the ball inches away from the end zone. The referees called it short but the pack got another touchdown with a handoff to Graves. They decided to go for a 2-point conversion but was not able to score which leaves the score at 39-6. The Datu called for a timeout before starting on their offense. There was 2:16 left in the first half. Running back Jerome “Jay” Laborte attempted to gain yards but was unsuccessful. The Wolves called for a timeout. 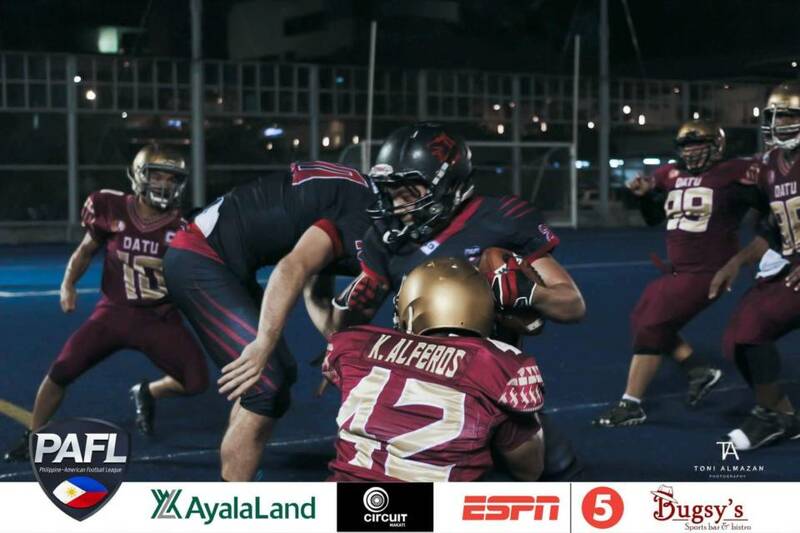 Alvero [quarterback] decided to run the ball but was stopped by Mambuay at the line of scrimmage. The pack called for another timeout. The ball was turned over to the Wolves after 2 more incomplete passes, one of them almost being an interception. Lim almost got an interception on the first play of the Wolves. After an incomplete pass, De la Peña caught the ball and was tackled a few yards short from the 1st down. Klaric assumed the position of quarterback and got the first down after running the ball. They scored another touchdown with a pass to Gayta but wasn’t able to get the 2-point conversion. The score was at 45-6. Velasquez gained 6-yards for the tribe before the 1st half ended. The 2nd half started with the Datu kicking team. Jumola with the return and was stopped at the tribe’s 40-yard line. After a quick pass to Gayta, the ball was passed to De la Peña but was interfered by cornerback Ryann Christian Pulvera. Another penalty was called on the Wolves before another touchdown was scored by De la Peña. Graves with the run to the end zone and the pack scored another two points [ 53-6]. Alvero got a 1-yard gain before being tackled by Favorito. He [Alvero] went for another run but was short on the 1st down. Velasquez gained 28-yards before being stopped by defensive back Khalil Tan. The referees called a horse-collar tackle on the defense which resulted in a 10-yard penalty. Velasquez again with a 4-yard gain but the tribe was penalized with 10-yards back because of a holding call. Velasquez attempted another run but lost 4-yards after being tackled by Favorito. The tribe went for their fourth down with a pass to Lim and got a 1st with 3-yards away from the end zone. Laborte did a run but was called short by the referees. Velasquez again with the run and the touchdown. Datu decided to go for a 2-point conversion but the pass was incomplete. An injury timeout was called as Jose Maria Jeruthielle “Toots” Vergara [Datu center] was down on the field. He was later escorted out of the field and was not able to return to the game. The tribe repeated the conversion with half the distance from the goal because of an off-sides call on the defense. Just before the pass was made, Alvero was sacked by Gunnacao. The score was at 53-12 with only 2:30 left in the 3rd quarter. Gayta caught the ball at the 20-yard line for the kick-return. The kicking team could not stop him from going all the way to the end zone which gave the Wolves another touchdown. The pack went and got the extra point leaving the score at 60-12. Velasquez ran out of bounds at the 30-yard line for the return. After an incomplete pass, Lim caught the ball and got the first down with 0:52 left on the 3rd quarter. The 4th quarter started after a bad snap from the offense. After an almost interception by the wolves, the ball was eventually intercepted by defensive back Jerome Bautista. The ball was almost fumbled but was still in Wolves possession. They started midfield. Wide receiver Walid Mo gained 6-yards before the tribe called for a timeout. Jumola got the first down before being stopped at the 34-yard line. Penalties were called against the defense, off-sides and face mask violation, which resulted in a total penalty of 20-yards. However, the pack had 2 incomplete passes before getting an 8-yard gain by Klaric. Jumola ran the ball up the middle and scored another touchdown – the pack got their extra point as well. [67-12]. Just after the kick-return, linebacker MC Oxales [Datu] was thrown out of the game for unnecessary roughness. Velazquez with the run but was stopped by Tan at the 17-yard line. He went for another attempt but was tackled 4-yards from the line of scrimmage. The tribe went for a pass to Vergara [wide receiver] but was covered by defensive back Paul Vincent Luces. Velasquez again with the run but was stopped by linebacker Kim Luy. Turnover on downs. Klaric blew the crowd away as he made another touchdown with a one-handed catch at the end zone. He got the extra 2-points as well. With only 5:00 left in the game, the score was at 75-12. 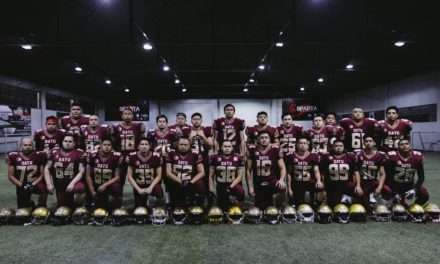 The Datu started at their own 25-yard line. They called for a timeout before starting their offense. A quick pass to running back Jade Waje resulted in a loss of 4-yards. The tribe went for a pass but was intercepted by Gonzales [linebacker]. 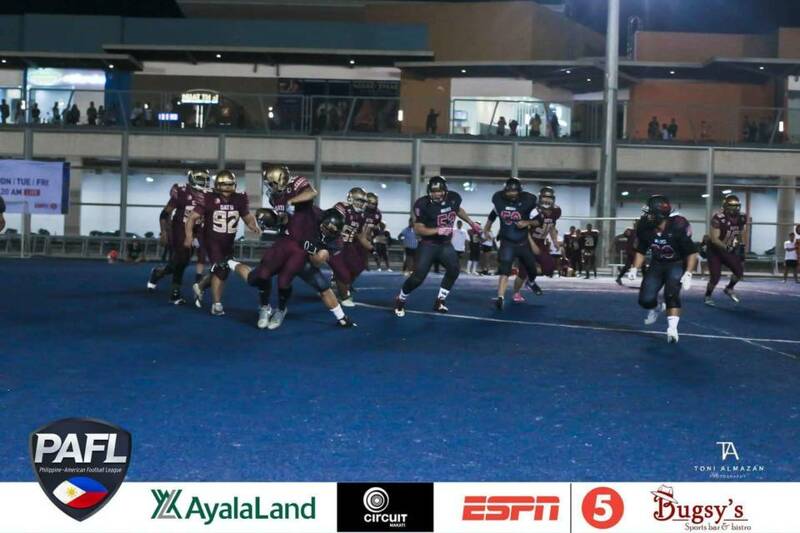 The Wolves started their offense on the Datu’s 17-yard line. Lim was able to sack Zetazate just before he passed the ball. Gayta caught it on the next play but was stopped again by Lim. Mo got the next catch but was short on the 1st. The pack got a 1st & goal after the defense committed an off-sides call. Zetazate quickly passed the ball to Gayta who ran to the end zone and scored another touchdown. Another extra point in the bag and the score was now 82-12. There was only 0:40 left in the game. After an on-side kick, the game ended with a score of 82-12. The Wolves continue to be undefeated for the regular season. The Wolves will face the Juggernauts on September 22, 2018, at 8:00 pm. Don’t forget to wear red!